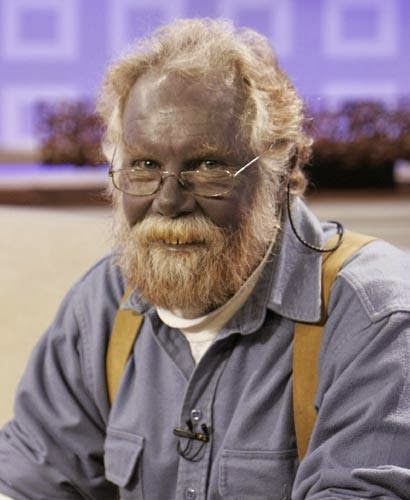 A man who turned blue after self-medicating for a skin condition says his hue is lightening. Paul Karason, 58, has the strange Papa Smurf look as a side effect of usin...g a silver compound which he used more than a decade ago to treat a bad case of dermatitis on his face. But he told NBC's Today Show that his skin is lightening because he is now using the self-administered doses of colloidal silver less. 'I’m in a place right now where it’s very difficult for me to make my own, and my resources are limited and it’s very expensive,' he explained to host Matt Lauer, a year after first appearing on the program. Colloidal silver is a suspension of silver in a liquid base - in this case, distilled water. Silver has antibacterial properties and has been used to fight infection for thousands of years. But it went out of use when penicillin, which is far more effective, was developed. If you have a story, photo, suggestion, complains or comments for us, send in your entry at rahs08@gmail.com and we will feature the story with your name.